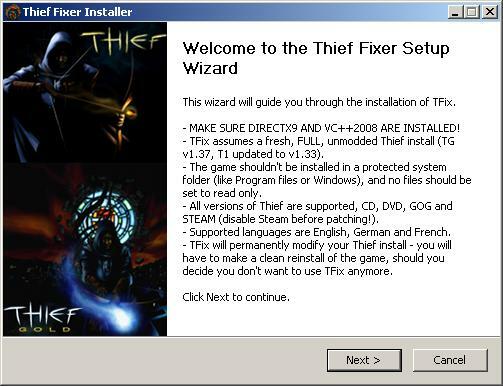 TFix is an all-in-one fix pack for Thief and Thief Gold (apply & play, no other fixes are necessary). it uses NewDark, the latest update of the Dark Engine - this improves compatibility with new pcs significantly, fixes graphic issues, adds support for widescreen resolutions and much more (also installs overhauled maps and resources - see the notes, including the final one). Make sure to restart your current mission after patching (clicking the "restart" button in the save/load menu). TFix Lite - modem connection? hard drive too small for the extra 100MB of resources? absolutely no interest in any tweaks, enhancements or mods? extracting this 6MB package into a full, working, complete oldDark install of T1 or TG will install NewDark and apply all the basic fixes that are required for it to work properly. unsupported, use at your own risk. -requires VC++2008 and the latest directx9 redistributable from june 2010. most pcs should have them already installed, but there is no harm in reinstalling to make sure. -do not set any compatibility modes on the exe, this will break the game. -installing the game to a protected folder (windows, program files etc) may result in strange and broken behaviour (vista+). -should you decide to try out some other combination of mods, just run the installer again and repick any desired combination. -if you have issues with slow walk and run speeds, try using the "classic" set of controls, load them through the options/customize controls/load menu. -when your movies still fail to load even after a reboot, try using the static linked lgvid dll from here (mirror google drive) - drop it into your Thief folder. -to install the Sound effects enhancement pack properly, open the pack with 7zip, open NewT1SFX.7z, extract the SFX folder. create a SND folder inside the USERMODS folder, and move the SFX folder into the SND folder. delete the SND folder to uninstall. the original installer should work as well, but consider it unsupported (meaning it might mess things up). -to install EP2, just drop the EP2.crf file into your Thief folder. delete the file to uninstall. -to install NecroAge, just drop the NecroAge.crf file into your Thief folder. delete the file to uninstall. -to install HDmod, just run the installer and follow the instructions. when done, copy this file into your Thief folder and overwrite - this will make sure all scripts and dml fixes will load properly (this is required for HDmod 1.2, hopefully future versions will not need this). to uninstall, repatch with TFix, and delete the hdmod folder when done. also, you don't use EP2, NecroAge and HDmod together, you pick just one. EP2 and NecroAge can be activated, deactivated and even swapped on the fly, HDmod cannot. 3. Extract the DromEd Basic Toolkit to your root Thief directory. Overwrite any files when prompted. 4. Copy the contents of .\tools\Thief1 Gold Newdark Dromed\ to your root Thief directory. Overwrite any files when prompted. 5. Open the NewDark package, then editor.zip, and extract DromEd.exe and darkdlgs.dll to your root Thief directory. Overwrite any files when prompted. -NewDark (and, by extension, TFix) uses DX9 by default, therefore, a fully DX9 compatible graphics card with hardware pixel shaders is required for everything to work properly. that would translate into Radeon9550 and GeForceFX5200 - if your graphics card is older (or does not have hardware pixel shaders), the DX9 mode may, or may not work without issues. if you are still using such a graphics card, and observe graphical anomalies, try out the DX6 safemode (run the game via safemode.bat). or upgrade your hardware. same goes for intel integrated graphics cards - they may work properly (gen5 and newer should), but consider them unsupported. -log all problems you find into the bugtracker google doc - press printscreen to make a screenshot (will be created in the SCREENSHOTS folder. also, before you take it, hit SHIFT+; to bring the console up, type show_stats and press enter) of the problem (incorrect texture, poorly placed object or anything else you find), make a quicksave (quick.sav in the SAVES folder), zip everything up, upload to some file hosting service (gdrive, sendspace, mediafire etc), and add the link to the appropriate field, add a short description and any other details you might know. you can also create a youtube video if you think it's better to see the problem in motion (and link that as well). the important part here is THE SAVE - this is something I absolutely need to be able to bugfix efficiently. note: ALL REPORTS WITH NO SAVE INCLUDED WILL BE IGNORED (unless it's some sort of general issue that happens everywhere). the tracker now also has a tab for reporting T2x issues. 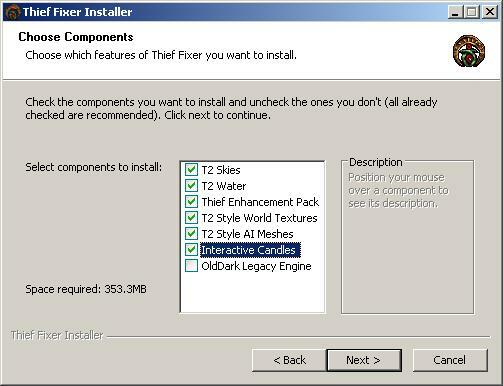 This is a fixer package for Thief1/Gold, it should make the patching and upgrading process a child's play. No guarantees it will work for you, of course - if it does, good, but if it summons pentagrams and zombies all over your place, well.. you have been warned. -fixes to way too many textures, models and objects to count, by way too many modders to list. thanks again, everybody! 1) make sure the game is not installed in program files or some other protected windows folder. 2) run the installer, select the mods of your choice (pre-selected ones are recommended). 3) run thief.exe (shouldn't require running as admin anymore). all credit goes to authors of the respective packs/fixes, I did not really do anything (maybe a bunch of cfg/ini edits and texture tweaks to make it all work together, but anybody could do that). v1.01: fixed the funky texture on the apemen. v1.03: cleaned up the file structure a bit. fixed the "missing cd" error some GOG users had. fixed an issue with audio channels always resetting to 8. one extra keyconfig added (WASD, by ZylonBane). v1.04: added more improved textures, fixed some typos in the readme. v1.05: added a new sky texture to "Break from Cragscleft Prison". one that actually does not look like 8 bit marshmallow puke. v1.06: adjusted some textures, added correct obj model for the sword. added T1 support. v1.07: adjusted more textures. removed the tgfix subdirectory from the archive, as this was confusing some users. v1.08: added installer (many thanks to Al_B from TTLG!). some more small fixes to the textures (seems like this will never end). v1.09: added fixed missions and objects (many thanks to Stan_The_Thief, antimatter_16 and everyone from TTLG who has contributed). v1.10: added support for all Thief versions - original, sold out, platinum, all should work, including their German and French derivates (again, many thanks to Al_B). v1.11: updated core files - this fixes video playback issues and crashes with hdradeons running under winxp (and more). the new stuff might interfere with saves made with TFix 1.10 or earlier, restarting the current mission is highly recommended. safemode.bat should help in case of catastrophic crashes or heavy rendering issues. try out enhanced.bat if you think you have way too much gpu and cpu power at hand. v1.12: fixed one broken texture, added the new editor. the exe has a proper icon now. added more keyconfigs. v1.13: small mission fixes here and there, the installer now has a proper icon as well. mods can now be installed/uninstalled just by running the installer again, no need to manually delete anything. v1.14: updated core files to 1.20, some more fixes to item placements, Maw creature portal should be finally fixed for good. v1.15: updated core files to 1.21. multimonitor ho! v1.16: some more dml fixes, especially for Mage Towers - all the pathfinding issues should now be fixed. added the USERMODS folder, any extra enhancement packs (models, textures, etc) should be placed there. v1.17: cleanup before the map overhaul. v1.18: corrected the name of the mesh pack (sorry, Daemonite!). a couple of map fixes to Cragscleft prison. EP2 ready - just drop EP2 (http://www.ttlg.com/forums/showthread.php?t=141621) into your Thief folder and it will load automatically (note: EP2 is still work-in-progress, visual anomalies may occur). fix for the over-sensitive AIs (beta). overhauled the Assassins level. fixed the starting area of Lost City, and Song of the Caverns. old file cleanup is now handled differently, should help to avoid issues with TDP crashing when the user has reinstalled the game without deleting the folder properly. steam build of TG should now be fully compatible. v1.19: overhauled Training, Bafford's, Cragscleft, Bonehoard, Assassins, Sword, Cathedral, Undercover, Strange Bedfellows, Thieves Guild, Mage Towers and Caverns, some of them almost fully, some partially. some other small fixes here and there (the old sword should not be hanging in the air on the place where you have hit something with it for the last time when you pick Constantine's sword, for example). v1.20: yeah yeah, this was supposed to be the interactive candle release, but now it's the NewDark 1.22 update. blame the Raven. also, cleaned up Training and Mage Towers just a little bit, and T2 sky and EP fixes will no longer get applied to FMs should the mission and/or object name be the same as with orig missions/objects. v1.21: implemented interactive candles. more map overhauling, Cragscleft, Bonehoard, Sword, Mage Towers and more. NecroAge (http://www.ttlg.com/forums/showthread.php?t=144312) ready, just drop the pack into your Thief folder. oldDark support readded, so if you want to play TFixed Thief on a windows95 machine, well, now you can. v1.22: core files updated to NewDark 1.23. included the fixed up wooden ladders (Olfred says hello), should look much better now with HD texture packs installed. adjusted mushrooms, Felix wall signs and some other objects at Bonehoard. also made the interactive candle setup slightly more efficient. v1.23: core files updated to NewDark 1.24. a bunch of small tweaks to textures and objects here and there. the Murus candle will have proper flame now (as long as interactive candles are installed). retextured the weird see through room in Strange Bedfellows as it looked just buggy. can't exploit new mantle in Haunted Cathedral Keeper library trap anymore, and the Watchman's Grave lucky coins will actually be visible after placing them into the bowl. also, the bowl will only be interactive on expert difficulty (when you actually have the coins and the objective). Ramirez alarmlights now actually light up when alarm is triggered in Assassins. v1.24: core files updated to NewDark 1.25, a few small tweaks to textures and objects here and there, added a fixed rotisserie chicken model (Olfred) and made it rotate where appropriate. all alarmlights now work properly, and Constantine can now use all of his attacks (so yeah, this is the first time ever the final bossfight works as intended). that annoying giant terrain spoon in the Little Big World has been replaced with a proper object spoon, hopefully NOT getting the player stuck so often (looks much better too). and the welcome screen now also has a PayPal donate link, feel free to hit it if you think my efforts are worth a buck or two. v1.25: some more small map bugfixes, and (thanks to a donated extra script) a much requested new feature - T2 style objective completion notifications. ding-dong! v1.26: core files updated to 1.26, few tweaks to objects and textures here and there. the extendable bridge setup in the Lost City should now work properly even in T1 mode. in case some of the authors of the packs/fixes do not like their works being distributed in this way, I'll take the download down immediately. Final note: NewDark works (quite) a bit differently than the original (T1) Dark engine, so, when playing T1/TG, there are small differences here and there (whether you install NewDark via TFix or manually). 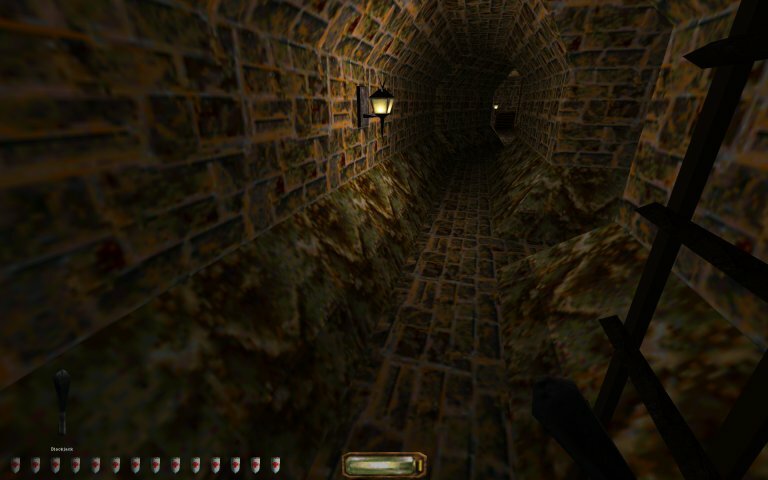 TFix tries to correct those (basically making the maps and gamesys more NewDark friendly), but making ALL things work EXACTLY like in the original Dark engine is rather impossible. therefore, if you want a 100% authentic, ABSOLUTELY true to the original experience, TFix (NewDark) is probably not a good choice for you. TFix (NewDark) is for those who "just want to play nicely, with as little hassle as possible". if you are one of those who can't live without rope death bug, or complain that "burrick's little toe now bends in a 45° angle instead of 40°", I suggest you try the Legacy executables - you can install them on the TFix mod screen (no support though, use them if you must, but don't come here crying if something does not work as you would like it to), or build a dedicated legacy pc for retro gaming (I can help out with that, as I own several of those). First happy customer here, but I'll be sure to tell you if hell has risen . Had no hopes for this...Terrific work voodoo47 ! It actually worked, i could enter the game without any problem, but before entering the game this pops out and therefore it shows me very low graphics as if i have not direct x in real. What should i do to prevent this stuation now ? Much appreciated your share and care. this looks like you haven't extracted all the files from the archive correctly.do you have ddfix.dll and ddfix.ini in your thief folder? edit: no, this is actually a default warning screen that appears on each first launch. check the "don't show again" box and it's going to be ok.
Last edited by voodoo47; 5th Aug 2012 at 11:00.
hmmm.did you also edit cam.cfg as mentioned in the readme? one more thing,make sure you are not using outdated drivers for your graphics card. yes, gpu and motherboard are all updated, if you come across any idea with this, please dont forget to let me know in further voodoo47, cheers. basically,that screen is something you should not see,ever-ddfix (part of the package) should take care of it permanently..all I can think of that some dumb windows security feature is denying full access or something like that,and as a result,not all files are overwritten as they should. as long as you have ddfix.dll,ddfix.ini and the new thief.exe,that screen should never appear..just to be sure,here is just the exe,try extracting it to your TG folder and overwriting one more time. Last edited by voodoo47; 16th Mar 2011 at 02:35.
at first, it asked for Thief CD2# later i handled it with no cd fix, done. But again that screen popped up, and the graphics were the same.. Really weird. this would explain that error message about directx not being installed-modifying thief.exe can break the package completely.so,if I understand it correctly,if you just extract the archive to your TG folder,the game will ask you for a cd? if that is true,do not use any 3rdparty nocd fix,just edit install.cfg (with notepad,for example),and try deleting the cd_path line completely. i completely deleted that line from the first line, but nothing changed unfortunately. Maybe i should try Thief 2, it may work, maybe. My english isn't that good, so forgive me. 1) Before your patch, I was unable to play Thief under Windows 7 since I re-installed a new copy of W7 (with SP1 included). Before this, with the first version of W7, I had no issues running the game so far (except for the multicore fix we all need in order to play). Your patch allowed me to start the game normally again but - for some strange reason - the levels are all painted in BLUE, with no textures - except for the sky, some few objects here and there (like torches, switches and some pipes) and the characters. Walls, ceilings, doors and even the floor are painted blue. Walking through a blue floor doesn't generate any sound of footsteps. Doors and gates are not visible, very odd. After some experimentation, I realize the problem seems to be the FAM folder - the water enhancement files. Removing this folder from the game directory, all textures are displayed normally again. I wander if I'm the first to report this issue. Am I doing something wrong here? 2) Another question, concerning ddfix in Thief Gold: the game starts in 1024x768. The ddfix EXE allows me to set only 3 pre-defined resolutions. Is it possible to apply a 1680x1050 resolution? if the answer is yes, how can I do it? The download link doesn't seem to work for me. When I click it, it comes up with "Sorry, we are unable to scan this file for viruses. The file exceeds the maximum size that we scan. Download anyway". So I click Download anyway, but it takes me to a webpage that cannot be found. Are the files available elsewhere? It's downloading for me OK. I'll upload it somewhere else once I've got it. Dammit. It's downloading very, very slowly but I'll try to get it before the wifi cuts out - internet doesn't seem to appreciate the howling gale outside. Download seems to be working now, was having a funny five minutes. I hope the fix works! Glad you got it - it worked for me. Thank you very much for this. I now have Thief Gold working on Windows 7 64 bit in 1920x1200 resolution. One minor problem remains, however, I cannot see the surface of any liquids. 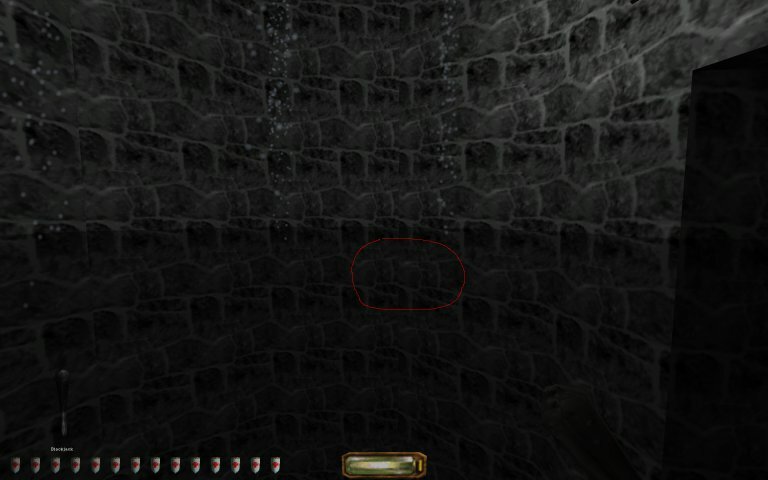 The liquids are definitely there (ie I swim when I am in them etc) and I can see the wall below the liquid look darker than the ones above it, but there is no texture on the surface (or the texture is veeeery translucent). Sometimes, on some liquids, I can see tiny little slivers of the surface texture. These slowly glide along across the surface of the liquid. If you look very carefully inside the ring, you might be able to see one (although it is almost invisible due to re-sizing and jpeg artefacts). I've had a search around to see if anyone else has the problem but I have not found anything. Is this a known problem? Last edited by Enjay; 12th Jun 2011 at 14:29.
guys,if you have all folders and files where they should be,problems like blue walls and missing water should not appear.the resolution must be changed manually in cam.cfg,I have already mentioned that. -extract the contents of the archive to your TG folder,overwrite old files. -run movecrf.bat (moves all original thief crfs to the RES folder.make sure that only EP.crf is left in the root folder,all other crfs MUST be in the RES folder for things to work properly). -edit cam.cfg and modify game_screen_size line to reflect the resolution you want (the default is set to 1024 768). basically,all you can do is double check that you have all folders and files at the right place.if you have done everything correctly,and it still does not work,well..bummer.guess I'm not as good with compiling mods as I originally thought. Last edited by voodoo47; 12th Jun 2011 at 15:20. — t2skies folder is present in your Thief folder. It should contain FAM\SKYHW subfolders. — t2skies folder is enlisted in install.cfg in the line resname_base. Try also changing WaterAlphaFix to 0 as it's supposed to fix water in T2, not in T1. I ran the bat file as instructed and all my crf files are in RES except ep.crf. cam.cfg has been edited and accurately relects my resolution (1920x1200). I do not have a t2skies folder (either in the Thief folder or in the ddfix folder). I made a clean Thief Gold install and then installed the downloaded patch. Neither the original install nor the patch included a t2skies folder. Similarly, there is not a FAM\SKYHW folder anywhere. My ddfix.ini did not contain any of the entries that you mention. I tried adding them (and playing about with whether they were set to 1 or 0 where appropriate) but nothing gave me water textures. Could these be relevant somehow? The PCX files look odd.  All the ones that I have checked (I checked some of the ones in my install directory and some in the 7z file directly) have just been black images except for the top row of pixels. The DDS files, however, look much as I would expect - ie they look like watery textures. The PCX files look odd. All the ones that I have checked (I checked some of the ones in my install directory and some in the 7z file directly) have just been black images except for the top row of pixels. And there we have it. I replaced all the PCX files in WATERHW with ones that I extracted from my original game and tried again and now I have water textures. I have re-checked the 7z archive and the PCX file are like the one I posted above so either these have been corrupted or some sort of replacement routine for them is not working (ie the DDS files do not seem to be getting used) but at least I have water textures now. Last edited by Enjay; 12th Jun 2011 at 19:50. Blank .PCX files are normal. They provide the palette and texture size to the core engine, and are replaced by ddfix while rendering. Having them in ThiefG\FAM folder is OK, but it may cause problems if you install FMs which may have FAM folder too. Please post contents of your ddfix.ini file. I wondered if that might be what the PCX files were meant to be being used for. For what ever reason though, my game is using the actual PCX files, not just using them as a reference for the replacements. I think that the ThiefG\FAM folder was created when I extracted the contents of the 7z (I can't check the 7z right now because I'm at work). All I did to extract the 7z was to open it in 7zip, select everything and drag/drop it into the ThiefG folder (then I ran the bat etc). I'll post my ddfix.ini when I get home from work. Thanks for all the input so far. It's appreciated. OK, here's my ddfix.ini. I know that the last 3 lines are commented out. They weren't there originally but I added them and then tried a few different options with them. However, because I couldn't get them to do anything, I just commented them out. I *think* everything else is still at the original default value. 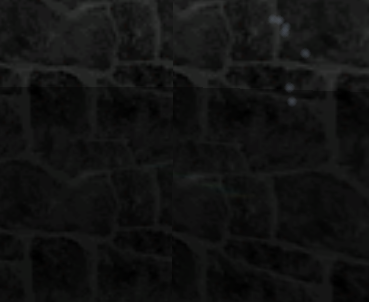 ;General fix for all Thief2 missions that use fog. ;Default value is 1 (enabled) so all mission that use fog can benefit. ;Special fog fixes for the Thief2 Original Mission "Life Of The Party". ;Enabling this for missions other than "Life Of The Party" may break other missions that use fog. I should probably mention that this is with ddfix 1.4.5. The version packed with the full fix in the first post (1.3.11) and 1.4.5 give exactly the same results in my game. The reason that I switched to 1.4.5 is that the ddfixGUI from 1.3.11 crashes whenever I try to run it (not that I need it). I have tried using ver 1.5.11 but when I try to start the game with my own patched thief.exe, the game doesn't start at all (my cursor changes briefly to the "waiting" appearance and then goes back to normal). If I try to use the patched exe for Thief Gold from the ddfix thread, it keeps prompting me to insert disk 2 into the CD drive (this happens whther the disk is in the drive or not). Last edited by Enjay; 13th Jun 2011 at 14:31.
just a small note-t2 skies is for t2 only,and does not work with t1/gold.t2 skies is not in the pack,just t2water.